Richard Spencer, the Baldur von Schirach of getting clocked in the face, was on the receiving end of yet more humiliation earlier today when he was peacefully cleansed from the Conservative Political Action Conference for being, in the words of its spokesman, “repugnant.” Being deemed too odious for a gathering where Steve Bannon counts as a headliner is embarrassing enough, but—as comeuppance for Spencer and his “alt-right” ilk tends to come swiftly and in several rounds these days—the shitting on Spencer didn’t end there. Before he was hustled off the premises, Spencer spent some time being pelted with questions by reporters, who were surely hoping the light from their cameras would once again attract someone’s flying fists. Among those queries used to stall him in place was a softball on whether he likes “rock music.” Spencer answered in the affirmative, according to New York Magazine’s Olivia Nuzzi, taking the opportunity to express his love of Depeche Mode with his usual scorched-earth talent for ruining everything around him. Though Spencer has drawn parallels before between danceable British synth-pop bands and the “alt-right”—once declaring Depeche Mode and New Order to be the “fashiest ’80s electro-pop bands”—he later clarified on Twitter that he was “obviously” joking. 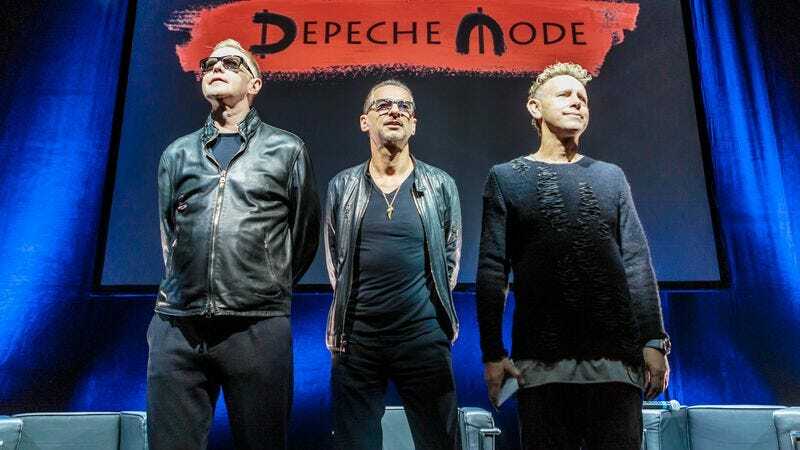 Nevertheless, he maintained that he has been “a lifelong Depeche Mode fan.” It’s a statement borne out by Spencer having done stuff like rank all of the group’s albums on Facebook, his placing of Black Celebration over both Music For The Masses and Violator just one of the many ways in which he is always wrong. Naturally, it was just a matter of hours before Richard Spencer’s favorite band also publicly declared it wanted nothing to do with him. In a blanket statement issued to any publication who asked for one, a Depeche Mode spokesman replied, “That’s pretty ridiculous. Depeche Mode has no ties to Richard Spencer or the alt right and does not support the alt right movement.” Unnecessary, perhaps: The band has made no secret of its liberal beliefs, beginning with its flirting with Marxist imagery on 1983’s Construction Time Again, and—while promoting its new, politically charged album Spirit—singer Dave Gahan recently compared Trump to Hitler. Not surprisingly, Depeche Mode doesn’t want to be associated with Reddit Hitler either. While it’s perhaps not on the level of Chris Christie being repeatedly spurned by Bruce Springsteen, or Paul Ryan being forced to delete Rage Against The Machine from his “Getting Pumped” gym playlist and replace it with the death rattles of cancer patients, there is always some small, meaningless sliver of joy in seeing a band telling one of its most devoted fans to get fucked. Now if only someone would forward this to New Order’s Peter Hook.